Are Screenflex Heavy Duty Room Dividers available? Yes! Screenflex heavy duty room dividers are designed to handle more strenuous use. They are manufactured with a heavier gauge metal than our Standard divider, and powder painted steel with powder painted metal trim. They have extra wide support legs, deep channel frames that wrap the panels, and dual over self-leveling wheels. We use an extra thick piano hinge between the panels for added strength. The multi-unit connector comes as a standard feature on all Screenflex Heavy Duty Room Dividers and allows you to lock dividers together to form unlimited lengths. An optional door and hanging marker boards can be added to provide a more private and interactive space. Watch this quick video to see the differences for yourself. 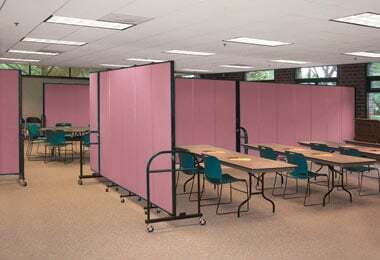 Screenflex Heavy Duty Room Dividers are a good fit for banquet halls, crowd control, convention centers, hotel, hospitality and anywhere there will be a lot of bumping and jostling of the partitions. They come in two heights: 6 feet tall and 7’4″ tall and 6 lengths. The lengths range from 5’9″ long to 24’1″ long. Choose your fabric or vinyl divider surface from one of our 38 colors.